Jesus went into the wilderness to fast and pray and learn from Heavenly Father. After He had fasted 40 days, Satan came to tempt Him. He offered Him things that He would want, but that were wrong. Jesus resisted. Jesus taught us by His example how we can resist temptations in our own lives. Through His spirit, we can receive strength to overcome and avoid temptations. We can also help others when they are facing temptations with gentle reminders, love, and prayers. 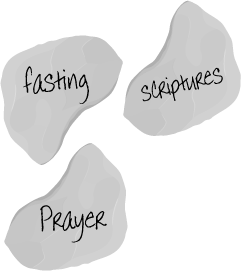 We can fast, pray and learn from the scriptures together. We can decide now to make good choices. All these things can help us when we face temptations. Jesus taught the people how to make good choices and asked them to follow Him. He called good men to help Him teach the people. He said they would be “fishers of men”. They would help many people learn to make good choices, resist temptations and follow Jesus Christ. What are some things Jesus did to help Him resist temptation? What are some ways we might be tempted? What can we do to resist temptation? What are some ways we can help our family avoid or overcome temptations? How can fasting help us? In this game, you must step on the stepping stones of faith, prayer, service, etc., but avoid the floor (temptation!) Work together as a family to get to one side of the room to the other. In Matthew 4:19, Jesus calls men to help him teach the people. They were humble fishermen, but He said that if they followed Him, He would make them "fishers of men". 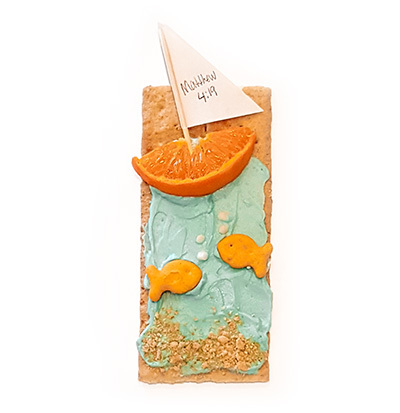 Help your family remember this scripture by making these cute treats!